Profit or nonprofit? Why it matters. There are many factors to consider when deciding which college to attend, including: culture, environment, location and degree program options. There are a few additional considerations that are often overlooked or misunderstood but important to investigate: for-profit or nonprofit status and regional or national accreditation. While revenue is important to all colleges, there are differences between how nonprofit and for-profit colleges use that revenue. For-profit schools are run more like a business, focused on creating income for shareholders. Nonprofit schools, however, re-invest revenue into the school. While for-profit colleges experienced increased popularity between 1990 and 2009, they have more recently come under significant government and media scrutiny due to their high costs (and greater student debt as a result). Nonprofit schools rely on additional funding sources, including private donors, to keep costs lower. The approach to course planning often differs between for-profit and nonprofit institutions. Lesson plans and courses at for-profit institutions are typically designed by an academic committee, and instructors are hired to teach from those lessons without much variance. The courses are job-specific with students gaining a definitive set of job skills and are less focused on personal growth and enrichment. Nonprofit colleges offer courses focused on all around student success and designed by professors who are likely to review and update those courses more frequently. In 2011, the National Bureau of Economic Research found that for-profit students experienced higher unemployment rates and lower earnings six years after starting their programs than comparable students at other schools. 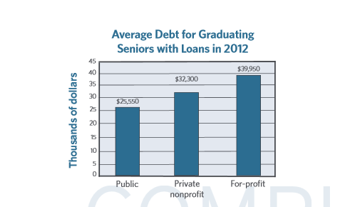 They also had greater student debt and were more likely to default on their loans. Source: Institute of College Access & Success. According to the Brooking Institute’s report published in January, 53% of borrowers who attended for-profit colleges in 2003 defaulted on their student loan debt after 12 years, compared to 23% of two-year community college borrowers 1. The type of accreditation often differs between for-profit and nonprofit institutions. Many for-profit institutions are nationally accredited, while nonprofits are typically regionally accredited. Regional accreditation is more widely recognized by employers, in part due to more competitive admissions standards. Due to the high expectations of these regionally accreditation bodies, many regionally accredited schools do not accept credits from institutions that are nationally accredited. This becomes an obstacle for learners when they seek to advance their education with an undergraduate or graduate degree from a nonprofit, regionally accredited school, often requiring classes to be re-taken and costing more money and time. If you are considering a college and unsure of its non-profit status or accreditation, you can research all colleges online. Southwestern College is a non-profit regionally accredited higher learning institution.